A while back, I wrote on here about my condiment collection. But more recently I went to the herb and spice cupboard (yeah I have a herb and spice cupboard!) and realised that I might have an even bigger obsession: salt. Looking at me were seven tubs of salt. Seven! How has it come to this? But they all have very different flavours and usage. Up until recently, Cornish Sea Salt was my number one favourite. Small, fat crystals with a clean taste. I love to sprinkle it on onions to sweat them, and dip roast beef into it for a sandwich with Sunday roast leftovers. And the packaging is just lovely- the colour evocative of a Cornish seaside village. Yeah I’m a sucker for good packaging, what of it? However, my loyalty has been swayed. A recent trip to Wales led me to the Halen Mon shop in Angelsey – well, I say shop but it was more of bit of corridor in the company portacabin! But what they lack in a fancy shop front, they make up for with amazing products. The big, soft flakes are almost sweet, if that doesn’t sound too daft for a salt. It crumbles easily and my husband loves a small sprinkle on his salmon. I actually came away with three varieties: the pure, spiced salt and celery salt. The celery salt makes boiled eggs pretty epic. And I can’t wait to try it on boiled duck eggs. The spiced salt is great when you’re frying onions for a curry. I’ve also tried it sprinkled on tuna and it has turned my head from my usual soy sauce marinade – fantastic. The latter two I actually got in dinky 10g tubes- a great idea as it lets you try something new without big investment in money or cupboard space. Last year, I visited the Lune Valley Smoke House up near Carnforth. Among the goodies I picked up was a jar of smoked sea salt. I have one use for this- it makes the perfect garlic butter. How I hear you cry? Take 5-6 big cloves (to be honest I probably use more as we are garlic fiends) and a good pinch of the salt. I stick them in my mini grinder thingy and pulse for a few seconds. I then add about 1/3 of a pack of soft, unsalted butter and whizz that in too. It’s great on garlic bread, but I also use it in risotto at the start so I don’t have to chop garlic, and to fry up mushrooms for a garlicy treat on toast. The smokiness is bob-on with garlic, but as I haven’t found any other use for it yet, all suggestions are welcome! There’s also some table salt in there which is as old as time itself- I use it occasionally when I attempt bread or some baking which calls for a pinch (though always use rather less than a pinch as I can’t get my head around salt in cake). The final, and least used salt, is in the grinder on the table. This is a Saxa sea salt (incidentally, up until Googling it for the link, I had always thought it was called Saxo!). It’s rocky, and to be honest rarely gets used. In terms of taste, it’s really just so-so compared with the others. Neither of us normally adds salt to our meals at the table, so putting it on there is just an old habit which dies hard…plus, it keep the pepper grinder company! 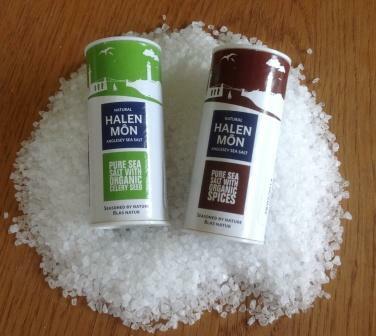 I’ve always thought that the more flaky sea salt wouldn’t grind, but as I have just seen a grinder on the Halen Mon web site it makes me think that I might ditch the Saxo/Saxa and put the good stuff in there instead. Not before you all start getting on your salt/ health/ heart/ blah blah high horses, don’t panic. I am a sensible salter. The food I cook is tasty enough that it doesn’t need drowning in the white stuff to make it better. But I do believe that you need a bit every now and then (I get salt craving with PMT) and I use it as an ingredient not a flavour enhancer. And if you have a problem with me using salt, I won’t even begin on my butter stance! So there you go. I have a salt shelf in my cupboard, and I’m proud of it! 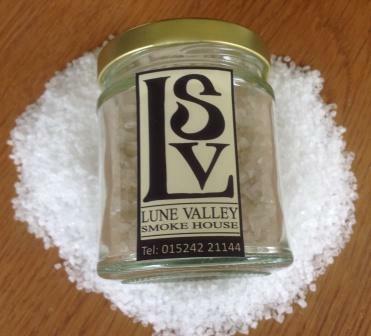 Of course, if there are any great salts out there you think I should be using, feel free to let me know. After reading this I understand why you are a Manchester Confidential Preferred Blogger (TM). The garlic butter recipe is, as you would say, bob on. While you’re here could I request you do a 5 Amazing Food Things To Buy In Manchester. Ithankyou.